My sidebar does not work? How do I customize the sidebar or add a box? If you are using WordPress 2.2, it should comes with WordPress Widgets. Login to your admin panel, go to Presentation > Widgets. If you are not using WP 2.2+, download widgets plugin from Automattic website. Do you have a 3 column theme available? I don’t have 3-columns iTheme available, but you can download a customized 3-column from MangoOrange. 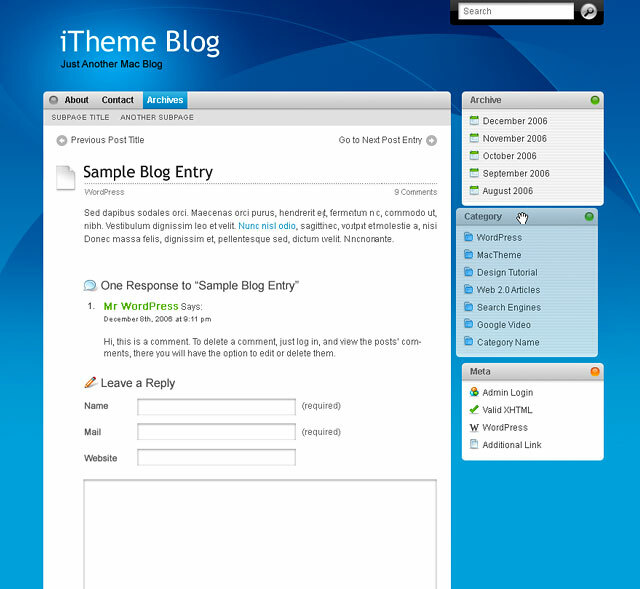 Do you have iTheme available in Drupal? Again, I don’t design Drupal theme, but you can download a converted version from Drupal community. Can I translate and distribute your theme? Can I use your theme for my client project? Absolutely, as long you are not selling my theme directly. Do you have a licensed version that does not require linkback? If you really don’t want to give credit linkback to N.Design Studio, contact me for a licensed copy.